I really wasn't planning this post. I was planning Killer Asparagus Soup and the now famous Arugula, Fennel, Reggiano Salad. 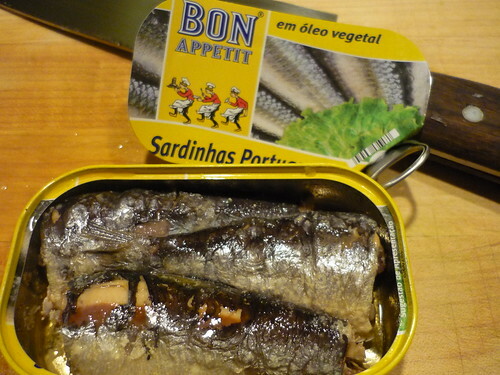 BUT, GG came home famished and I was behind schedule on the soup, so we popped a tin of Bon Appetit Portuguese Sardines. SHE was hungry, SHE needed her Omega 3's. 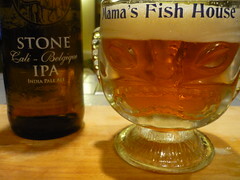 SHE needed the Stone Cali-Belgique IPA. She came home after a long day dealing with K - 5 children. So she agreed and I made up a platter that looks just like the one found here, and popped a big beer. These are good fish You can read oldschooly's Experience. They are Valentine Worthy. Three big fish, skin and bones. I'm with you fellas. Good Fish. Four out of Five Tins. A Cali IPA with Belgium Yeasts. I'm kinda loving this. Hoppy, Golden, Good Beer. It's Low Octane, and that's ok, next time I'll get a couple.